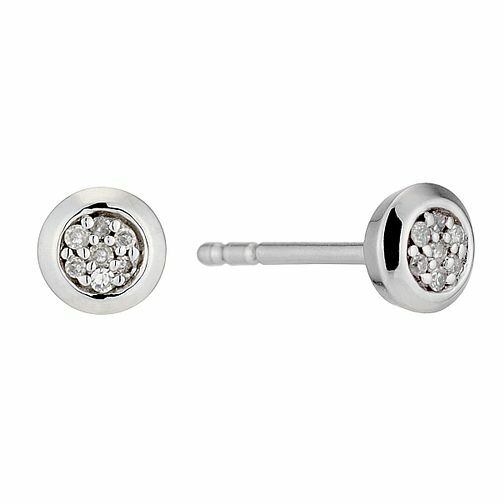 9ct white gold diamond stud earrings set with a white gold edging. Simple style for everyday wear. 9ct white gold diamond stud earrings is rated 3.0 out of 5 by 4. Rated 2 out of 5 by Anonymous from Earrings O.K. but gift packaging awful The good news is that the earrings were O.K. and made my wife happy. The bad news was the gift wrapping that I paid extra for. Whilst this didn't cost a lot, I was expecting the box to be wrapped in paper wrap and finished off with a nice ribbon bow on it. What I got was no paper wrap and an over-sized bow alongside the box. The bow was glued together (bought in as a job lot?) and could be placed loosely around one side with 2" of slack. It wasn't long enough to wrap round both sides of the box and form a cross as I was hoping for. Being glued together it gave me no chance of tightening the ribbon and making a new bow. I threw it away and did the gift wrapping myself. The personalized message was another disappointment. When doing this I couldn't find a way to start new lines, consequently the card had my message on one line, more like a text message. Rated 4 out of 5 by Anonymous from Some good, some bad. Overall, a lovely product but the clasps did not attach very well so had to go in store (Whiteley) for adjustment which was a shame. However, the service was faultless so we were pleased overall.